Introducing the Peace of Mind Plan! Now Available! 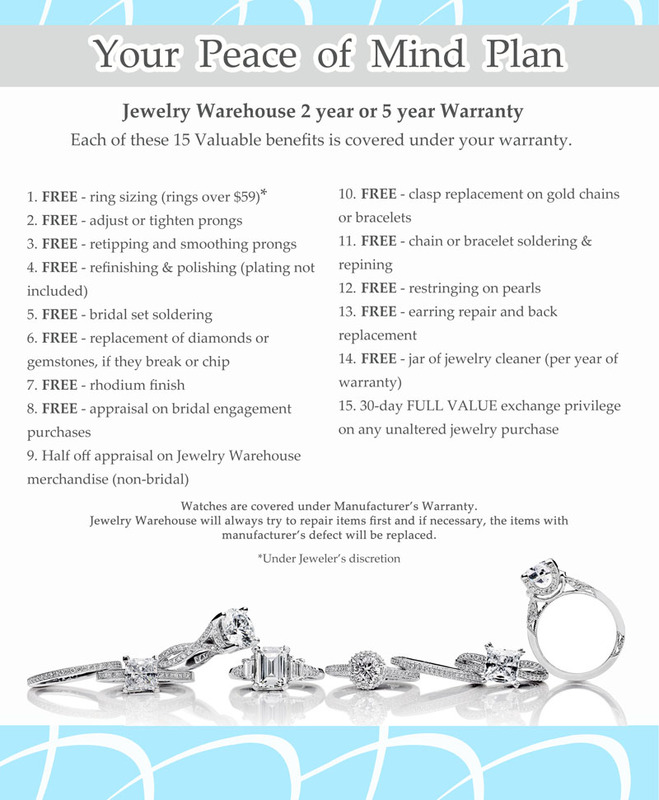 The new Peace of Mind Plan – Add an additional 2 or 5 year Extended Warranty Plan to your jewelry! There are some exclusions to our Peace of Mind Extended Warranty. We have listed most of them below but please see stores for details on any additional exclusions on your purchase. This service is non-transferable. What is not covered: This is not a replacement plan. All maintenance/repairs shall be completed by Jewelry Warehouse or by a repair center of Jewelry Warehouse’s choice. Failure to comply will void warranty. Watches are not covered under the Plan. Nothing herein shall obligate us to repair or replace materials resulting from excessive or abusive treatment of merchandise other than normal wear and tear. This Plan applies only to the use of the merchandise under conditions for which it was designed. It does not cover loss, theft misuse, abuse, or damage resulting from fire, flood, sand, dirt, windstorm, hail, lightening, earthquake or Act of God. If you purchase the Plan after you purchase the Merchandise, the Plan does not cover pre-existing conditions in the Merchandise that occurred after you purchased the Merchandise and prior to the effective date of the Plan. The Plan does not replace, but supplements, any other warranties/guarantees applicable to the Merchandise. You must and should have all maintenance on the Merchandise required by any applicable underlying warranties/guarantees. Damage resulting from failure to comply with recommended services and/or maintenance under such warranties/guarantees is not covered by this Plan. In no event shall Jewelry Warehouse be liable for consequential damages or delays in rendering service under this plan, or loss of use during the period that the merchandise is being repaired or otherwise awaiting parts. Parts may be replaced with others of like kind and quality. The plan does not include replacement of ring shank due to loss of gold in the sizing. This plan does not include plating. Prices of your plan will vary depending on the cost of the jewelry you purchase. 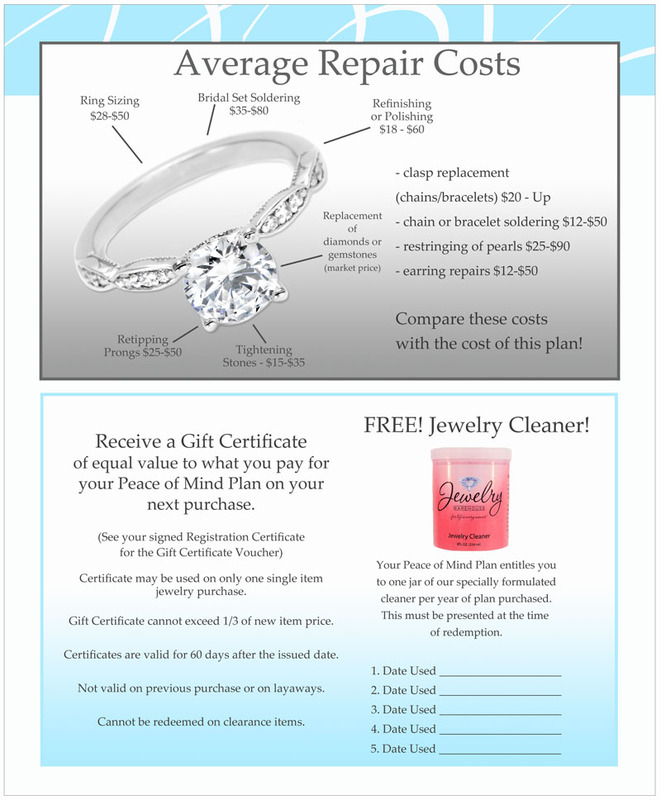 Stop by any Jewelry Warehouse location today for more information about our Peace of Mind Plan! This entry was posted in Birthstones, Diamonds, Jewelry, Jewelry Guides, Jewelry News, Jewelry Tips and tagged extended warranty plan, jewelry peace of mind plan, jewelry warehouse extended warranty, peace of mind plan. Bookmark the permalink.